Take a fun field trip with Friends or volunteer as a Egmont Key Bird Steward or Docent summer. Click on the link above. 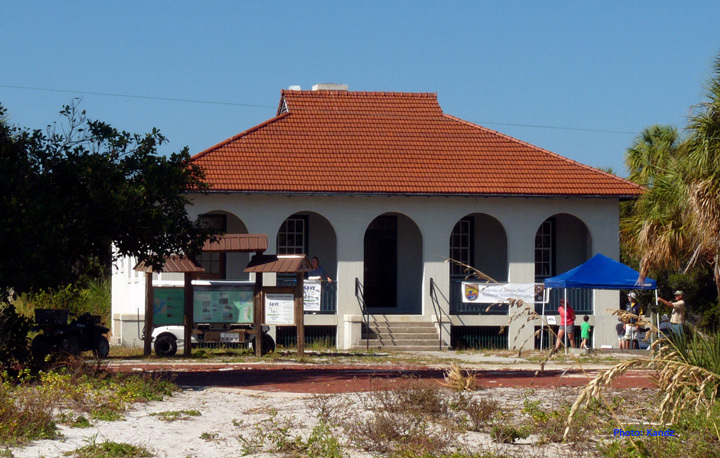 Join us for our annual tour of Egmont Key on June 15. 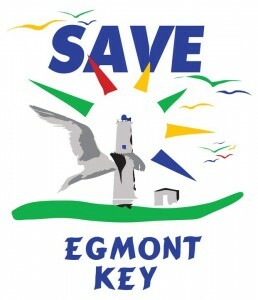 June 15 (Saturday) Egmont Key Sanctuary Tour from 5 – 8 pm. Reservation required, trip fee $25 per person for Friends members. Guests will need to join Friends in addition to the $25 trip fee ($25 family or $15 individual) This event fills up fast, book now. Email TampaBayRefuges@msn.com to reserve your space. Payments can be made online at www.TampaBayRefuges.org, look for donate tab on left, or mail FTBNWR, PO Box 40782, St Petersburg, FL 33743-0782. The Friends are building oyster domes with Tampa Bay Watch for installation at Little Bird Key in the Pinellas National Wildlife Refuge. You can sign up at www.tampabaywatch.org or contact Pat Mundus for further information, docents@tampabayrefuges.org, 720-966-3660. 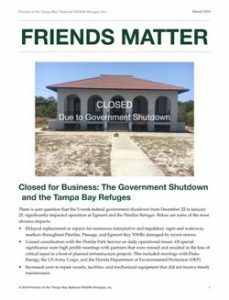 The new Friends of Tampa Bay National Wildlife Refuges “Friends Matter” newsletter is online! Save the Date: More Exciting Tours! 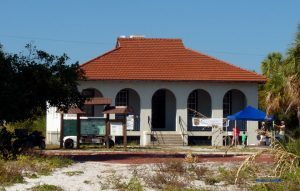 With the government open for now, the Egmont Key Guardhouse Education Center will open to the public. We need docents for weekends and the big spring break season (most of March), so sign up if you can and enjoy some time on the island! Open the link below to the doodle poll. Select the day you would like to volunteer. Transportation to Egmont Key is provided. Egmont Key Sea Turtle Success Story! In 2017, Loggerhead sea turtles laid 114 nests on Egmont Key NWR which was a record. But they returned this summer and laid 151 nests for a new record. Only 11 of the nests failed since they were laid too close to the high tide. They were inundated with salt water. In total, over 12,000 hatchlings made their way out to the Gulf, swimming to the safety of the Sargassum sea weed in deep water. Almost all of the nests hatched before September 8, when red tide rolled into Pinellas County. Only 15 hatched during red tide and hopefully those little guys did ok as they made a beeline to better water in the Gulf. Thanks to Eckerd College interns, Katie & Danielle Birk, as well as State Park staff for monitoring and recording the nesting success. Read about the Miller Island cleanup and other news in the Friends Fall newsletter. Beach habitat is important for wildlife. Many types of wildlife depend on Florida’s beaches for their survival, including endangered and threatened species. To be a knowledgeable pet owner, please download the brochure. Why Should I Adopt a Nest ? Because beach erosion and sea level rise create constant threats to nesting habitats, sea turtle nests need to be protected and monitored. By adopting a nest, you support educational programming and the Eckerd College interns who will protect, monitor, and collect nesting data during the nesting season. For more info, visit our Adopt a Sea Turtle Nest page! Don’t forget to support the Friends of Tampa Bay NWR when you shop at AmazonSmile! For other events visit What’s Happening page. If you’d like to volunteer to help on any bird surveys, in the Guardhouse as a docent, or at the festivals please contact Barb TampaBayRefuges@msn.com or 727-343-1272. Friends of the Tampa Bay National Wildlife Refuges promote conservation, awareness, and appreciation of the Refuge Complex and provide assistance to the mission and programs of the U.S. Fish and Wildlife Service. The National Wildlife Refuge System, managed by the U.S. Fish and Wildlife Service, is the world’s premier system of public lands and waters set aside to conserve America’s fish, wildlife, and plants. In Tampa Bay, we are fortunate to have three National Wildlife Refuges: Egmont Key, Passage Key, and the Pinellas Refuges. The Refuges’ natural areas provide prime habitat for migratory and beach nesting birds to safely “nest and rest” free from human interference. At Egmont Key, increasing numbers of sea turtles also find suitable and secure habitat for laying their eggs each breeding season, and a large and growing population of gopher tortoises safely move about the island, constructing burrows that protect them and many other species during severe storms. Encourage membership through opportunities that support the efforts of the Fish and Wildlife Service at the Tampa Bay Refuges. Raise money to fund conservation, preservation, and educational projects in support of the Tampa Bay Refuges and the National Refuge System. Provide environmental education programs to elementary age students that takes them out of the classroom and into the school yard where they learn to relate conservation and sustainability concepts to their daily environment. Sponsor periodic Refuge clean-ups of exotic plants, debris, and mono-filament that are damaging to wildlife and habitat. Offer public educational programs on conservation and preservation topics, the Tampa Bay Refuges, and the national Refuge System. Provide bird stewards at Egmont Key who monitor secured areas and ensure that birds can safely nest and rest during periods of high boater visitation to the island. Survey nesting and resting birds at the Pinellas Refuges each month to measure changes in population and evaluate effectiveness of conservation programs.